Each picture below is a screen grab from an available clip of stock footage. Click on the picture to bring up a window that will allow you to preview a watermarked version of the actual footage and include more detailed information. You will need to have Media Player installed on your system to view the footage. Media Player is provided on all PC's as standard and is available for free as a download from the Apple web site. Click here for more information and to install Media Player for the MAC. The B-58 "Hustler," the world's first supersonic bomber, carries a crew of three riding in separate tandem cockpits. Powered by four jet engines, the first prototype of the "Hustler" made its initial flight on November 11, 1956. 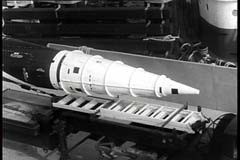 A large detachable pod carried under the fuselage used to house part of the weapon system may also be used to transport extra fuel. The speed, range and deterrent power of the B-58 Hustler make it a welcome addition to our arsenal of strategic weapons. In-air refueling gives the B-58 an intercontinental range. Tactical Air Command's Composite Air Strike Force of mobile fighter units is more than combat aircraft and reconnaissance planes. These quick striking units also consist of ground support equipment and personnel for maintaining aircraft in the field for weeks at a time. The Air Strike Force is always on the alert and ready to move when the order is issued. Because of outstanding training and teamwork, tactical units are ready for action at oversea bases within a few hours after receiving an order. Captain Joseph Kittenger Jr uses the age old balloon ascension to make scientific investigations in the outer researches of the earth's atmosphere. 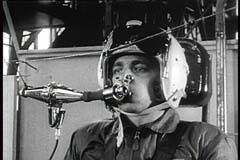 On August 17, 1960 he tests a small stabilizing parachute by jumping from an open gondola balloon, freefalling seventeen miles during which he reaches a speed of 320 miles per hour. The small parachute prevents him from spinning but does little to slow his free fall. At 17,500 feet his main chute opens and brings him safely to the ground. His record-shattering exploits set the stage for future explorations of space. 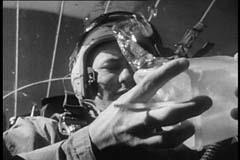 With the eminent prospect of manned orbital flight, the reaction of the astronaut to the sensation of weightlessness and his ability to perform manual operations are questions requiring immediate answers, The Aerospace Medical Laboratory at Wright Patterson AFB is currently using a modified C-131 as a "zero G" laboratory. Through tests conducted in this and other aircraft, our scientists are learning what effects prolonged exposure to zero gravity will have upon man. 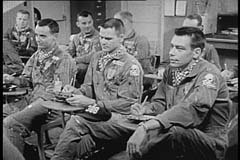 Air Force medical researchers apply their skills systematically in an effort to determine the physiological and psychological effects of space travel upon man. A heat chamber is used to test a full pressure suit and closed circuit oxygen system. 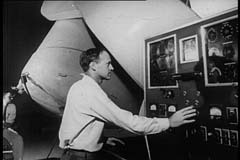 Another apparatus provides data on man's reaction to blast-off buffeting and weightlessness, and the effects of vertical acceleration. A rocket sled tests man's endurance to rapid acceleration of blast-off and the intense deceleration of re-entry. Air Force scientists engaged in solar research have an observatory atop a ninety-two hundred foot mountain in Sun Spot, New Mexico. Their aim is to determine the effect of certain solar phenomena on communications and weather on the earth. A powerful sixteen inch telescope is pivoted to follow the sun and observe solar disturbances. 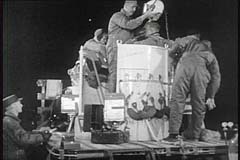 A motion picture camera records the sun's activity for later study. 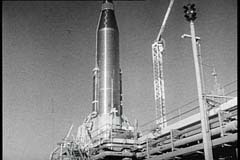 The Atlas missile, now operational in the Strategic Air Command, is a true intercontinental ballistic missile. It has a range of 5,500 miles and travels at twenty times the speed of sound. The Atlas has an inertial guidance system that operates well beyond the range of radio or radar guidance systems and cannot be jammed by enemy countermeasures, Although developed primarily as a strategic weapon, the Atlas also plays a key role in space exploration. The BOMARC is a long range defense missile capable of intercepting high flying invaders at distances up to 400 miles from the point of firing. 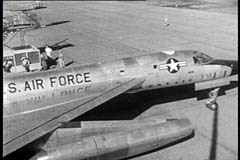 First tested in the autumn of 1952, its speed is in excess of Mach 2. 5. It is the only long range surface-to-air defense missile yet announced anywhere in the world. The BOMARC can be fired singly or in multiple and can be directed to intercept individual bombers or air-breathing missiles of a mass attacking force. It is a true pilotless interceptor. 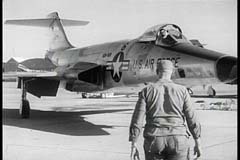 The F-101, noted for its speed and maneuverability, plays an important role in the struggle for peace in the free world. In its first test flight, piloted by Major Adrian Drew, it sets a new world speed record of 1, 207. 6 miles per hour. Speed, maneuverability and varied armament make this ground support aircraft a valuable weapon for limited wars. Air to air refueling gives added versatility and extended range to the F-101.